North Korea claims it has conducted a fourth nuclear weapons test explosion and early readings from seismic stations in the region strongly suggest a relatively low-yield underground nuclear test was conducted. 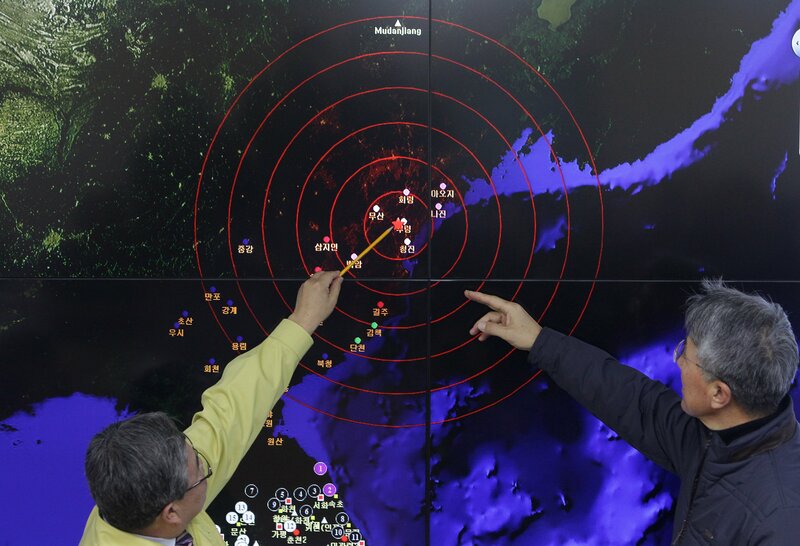 According to the Vienna-based Comprehensive Test Ban Treaty Organization (CTBTO), the “initial location estimate” of the seismic activity shows that the event took place in the area of North Korea’s nuclear test site, Punggye-ri, which is located in the northeast of the country. The test has been universally condemned as a threat to international peace and security and a violation of the global taboo against nuclear testing. According to a government statement aired by the North Korean Central News Agency, the nuclear test took place on Wednesday, Jan. 6, at 10 p.m. North Korea Time (8:30 p.m. Eastern Standard Time on Jan. 5). The North Korean government claimed the successful test “scientifically verified the power” of a small hydrogen bomb. The statement claimed that the test signifies a “higher stage” of development of North Korea’s nuclear force. Whether the “hydrogen bomb” claim is true or not is unclear. North Korea’s three previous nuclear test explosions (October 9, 2006, May 25, 2009, and February 12, 2013) are all believed to be one-stage, fission weapons. A hydrogen bomb is generally more powerful due to the release of energy from the nuclear fusion of isotopes of hydrogen (deuterium and tritium), using a fission bomb as a trigger. Last month a report from the South Korean military's Chemical, Biological and Radiological Command said it “did not rule out the possibility” of a boosted fission bomb test by North Korea, although it assessed that it “does not believe [North Korea] is yet capable of directly testing hydrogen bombs.” Initial South Korean intelligence estimates after the test cast doubt on a hydrogen bomb due to the small yield size. The 2013 test initially measured a magnitude 5.0 (later revised to 4.9), similar to the initial readings on the 2016 test (an initial reading of 4.9 magnitude, which was revised to 4.85 magnitude upon further analysis). Expert assessments of the explosive yield range from 6-10 kilotons for the 2013 test. The 2009 test was approximately a magnitude 4.5 (with a yield of about 2-5 kilotons) and the 2006 test was measured at a magnitude 4.1 (about 0.5-1 kilotons yield). Determining what kind of fissile material was used for the bomb will be a challenge even if the radioactive gases produced by the test are once again detected by remote monitoring systems and airborne detection systems — a process that can take several days or even weeks as noble gases produced by the explosion seep up from the ground into the atmosphere. In 2013, CTBTO monitoring stations did not detect radioactive particles from the test until mid-April. Whatever the type of design of weapon tested by North Korea or its exact yield, this fourth nuclear test has undoubtedly advanced North Korea's technical understanding of their nuclear designs. North Korea does not currently deploy a ballistic missile with a range capable of reaching the United States. It has never tested its intercontinental ballistic missile (ICBM), the KN-08, and significant technological challenges — such as engineering a re-entry vehicle and conducting proof tests of more compact and lighter nuclear warheads — must be overcome before Pyongyang can deliver a nuclear warhead on an ICBM. North Korea is the only country to have conducted a nuclear-test explosion in this century. Even though North Korea has not signed nor ratified the 1996 Comprehensive Nuclear Test Ban Treaty (CTBT), it is prohibited from conducting nuclear tests by UN Security Council resolutions. Past tests have led to sanctions and international condemnation. Today the UN Security Council will meet in emergency session to address the latest North Korean test. But business-as-usual cannot be expected to work effectively enough. Additional sanctions against North Korea may be warranted for political value alone, but stronger and tighter enforcement of existing UN Security Council sanctions against North Korea and entities that deal with its nuclear and missile programs, particularly by China, should be the first order of business. Sanctions alone will not resolve the North Korean nuclear crisis. President Barack Obama, and the next U.S. president, can and should be prepared to forge a more effective U.S. and international strategy to blunt the growing North Korean nuclear threat. A new policy begins by recognizing that without renewed and effective diplomatic engagement with North Korea designed to verifiably halt its nuclear and missile programs, North Korea will likely continue to advance its nuclear and missile programs. Unfortunately, the United States and North Korea have haggled over the conditions for resuming nuclear talks for too long, with Washington insisting that North Korea make it clear it will abide by its broken 2005 denuclearization pledges. Realism demands the immediate pursuit of a freeze on the testing of nuclear devices and nuclear-capable missiles, instead of seeking (and failing) to achieve another unreliable pledge to denuclearize the country. Such a double freeze would be a significant achievement, preventing North Korea from undertaking the testing needed to assure a reliable and versatile nuclear weapons arsenal. A testing freeze would also be verifiable without winning North Korean acquiescence to intrusive inspections measures. It is clear from the difficult, but successful P5+1 (China, France, Germany, Russia, the United Kingdom, and the United States) talks with Iran, that diplomacy can lead to a win-win outcome that freezes and rolls-back the proliferation potential of states of concern. In addition, the international community must respond to North Korea’s fourth nuclear test with concrete action from the UN Security Council and all other major states to reinforce the global taboo against further nuclear testing by taking action to bring the 1996 CTBT into force. As Lassina Zerbo, Executive Secretary of the Commission for the CTBTO said in Jan. 6 statement, the fourth DPRK test should "serve as the final wake-up call to the international community to outlaw all nuclear testing by bringing the CTBT into force." If North Korea’s nuclear and ballistic missile programs remain unchecked and if key states do not renew the global push to ban all nuclear testing the threat posed by North Korean nuclear testing - and potential nuclear tests by other states in the years ahead - will only grow. It is time for the U.S. to re-think its policy toward North Korea and for the other leading states to redouble their commitment to the CTBT and the global taboo against nuclear testing. A renewed push for a negotiated freeze on ballistic missile testing and nuclear testing would halt Pyongyang’s progress and give the United States and its partners time to negotiate a comprehensive agreement to dismantle North Korea’s nuclear weapons program.